Owning your own restaurant can be exciting and lucrative. This is a dream of many food service workers who aspire to take on more responsibilities and believe they have what it takes to be successful. However, the job description of a restaurant owner includes many duties and major accountability. Being the owner requires skills, assistance and dedication. Any one can own a restaurant, but it takes more than desire to own a profitable one. A restaurant owner is the one who has all of the responsibilities of maintaining and running the business. A restaurant owner is sometimes also the restaurant manager. The actual job description depends on the other workers employed. Some owners have various managers who supervise specific departments and then report to them. Others take care of every one of of the aspects of the restaurant. The bottom line is the owner is the one who keeps the business running on a daily basis. A restaurant owner must hire someone to take care of many of the required daily functions of the business or perform these jobs personally. This includes overseeing, ordering and tracking all of the food, supplies, equipment and other inventories needed. It also consists of maintaining the building and equipment (inside and outside), the parking lot and any other property of the business. Other jobs may include hiring, training, directing, scheduling and dismissing employees. The finances, promotions and goals of the business are part of the owner's responsibility. A restaurant can be a very tense and chaotic environment at times, which must be handled in a rational way. Restaurant owners have to make decisions during emergencies. They are the "face" of the business to the public and should be comfortable dealing with customers in both good and bad moods. They also must be able to manage the employees of the restaurant and keep up with state and federal laws and regulations. The owner is often the first person to arrive and the last to leave and often is required to be present during busy times like weekends and holidays. There are no specific educational requirements to be a restaurant owner. 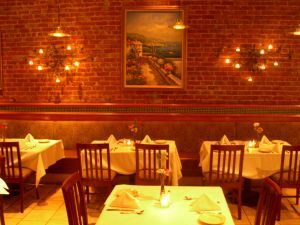 If you have the finances, the property and the inventory needed, you can be a restaurant owner. It is very helpful to have an extended background working in the food service industry and further education. Receiving a two- or four-year degree in hospitality and restaurant management provides a good background. Other types of degrees or certifications can be obtained at community colleges, technical or specialized organizations. An owner should have leadership traits, excellent communication skills, analytical capability and self-confidence. According to the Bureau of Labor Statistics, U.S. Department of Labor, Occupational Outlook Handbook, 2008-09 Edition, 45 percent of all food service managers are owners of independent restaurants or additional small food service businesses. It also states that almost 30 percent of the food service managers will advance to become self-employed. The U.S. national average salary of a restaurant owner at $23,099 in 2009. This number varies for different regions of the country.